The term Enterprise Resource Planning (ERP) has become so generic in manufacturing; it’s no wonder people find themselves lost in the sea of software providers. In fact, if you search Google for “sign manufacturing software,” you’ll get 146,000,000 results! While there certainly aren’t 146 million software providers, there are more than enough options to confuse anyone looking at ERP for the first time. Let me offer some advice to help you narrow down your options, that apply to you no matter where you are in a software evaluation process, and even if you have never considered ERP. When you purchase Cloud ERP, you’re entering into a marriage of sorts with your software provider. You rely on this provider to carry the lion’s share of software responsibility, and you must do your homework to find out how committed your proverbial “spouse” is going to be. ERP is a significant investment for any sign company. You should be confident that your software provider will be responsive, supportive and aligned with your business goals. In fact, your software provider demonstrates this best by offering technical support, including user groups that give you and your team members an opportunity to help shape the product’s ongoing development. Identify what you want in a business partner and keep that in mind throughout your decision-making process. The Cloud is not a buzzword; it’s the software delivery method that is changing the way companies do business. You know that the Cloud gives you anytime, anywhere and any device access to your business information. This means your salesperson can reference a quote on his phone in a client’s office, or your installer can view project plans on a tablet at a job site. But it’s also so much more than that. Your team is more likely to use software they find easy to navigate. And the software your team is willing to use gives you better information that you need to run your business. But if you’re still not comfortable with the idea of Cloud software, consider this: when you bank online, use Netflix or Gmail, you’re already using the Cloud! According to the ISA State of the Industry Report 2014, the biggest pain point that sign companies identified, after sign code regulations, is maximizing profit margins. However, companies who use ERP software can access real-time margin reports, comparing actuals with estimated costs. Imagine what this visibility will do for your profitability! Furthermore, ERP built for your industry – sign manufacturing – comes pre-loaded with the processes, reports and insights that are unique to your business. In other words, you should choose an ERP provider that helps you confidently make business decisions based on the maximum profitability for your company. 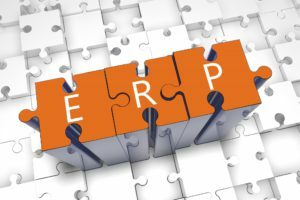 In summary, it’s no surprise you may be confused in what seems to be innumerable ERP software choices. However, my 20+ years experience in ERP software tells me that what sign manufacturers need to consider most when evaluating ERP software is to find a Cloud-based solution, capable of giving you the reporting and analytical insights you need to grow, delivered by a provider who will be your strategic business partner. If you’re ready to learn how KeyedIn can help you achieve your business goals, visit our website to learn how sign manufacturers just like you have benefited from Cloud ERP. To learn how KeyedIn Manufacturing – Sign Edition helps sign companies better manage their business, click here.